The Lakvijaya Power Station (also known as the Norocholai Power Station, after its location) is the largest power station in Sri Lanka. 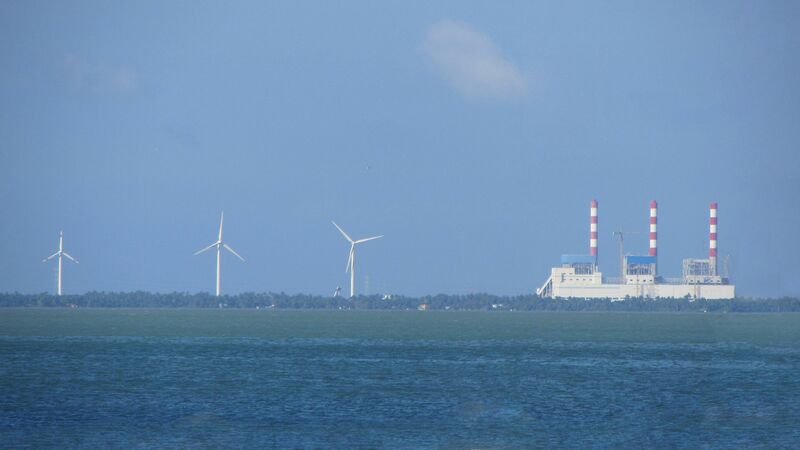 The power station is located in Norocholai, Puttalam, on the southern-end of the Kalpitiya Peninsula. Construction of the facility began on 11 May 2006, with the first unit commissioning on 22 March 2011. 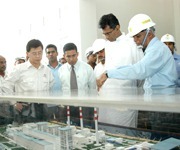 The first 300-megawatt phase was completed and ceremonially commissioned by PresidentMahinda Rajapaksa on 22 March 2011 at 18:27 local time, with the presence of Minister of Energy Champika Ranawaka, deputy Minister of Energy Premalal Jayasekara. The former Minister of Energy John Seneviratnecould not attend the event as he was injured in a traffic accident on the way to the ceremony. According to the Ceylon Electricity Board, the US$455 million first phase generates nearly 1.7 TWh of electricity annually; a significant amount when compared to Sri Lanka’s total production of 11.5 TWh in 2011. 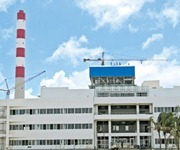 The plant is connected to the grid via 115 km (71 mi) 220-kilovolt transmission line to Veyangoda. Power station exhausts are emitted through a 150 m (492 ft) tall chimney, one of the country’s tallest man-made structures. During its pre-development stages, a number of protests were launched by residents living at the project site, claiming that they were deceived by the government. In the plant, basically the electricity is produced using steam turbine which is capable of producing 300MW. Coal is used as the fuel in the purpose of producing steam that will then be used to rotate the turbine in the speed of 3000 rpm. Coal is imported from Indonesia since it is cheap and good in quality. Even though the coal in India is very cheaper as compared with Indonesia, Indonesian coal is used since the coal in India contains more sulfur. Despite this the current vessels which carry coal is coming from a port of Russia. At first the coal is brought from Indonesia via ships (65 tons per ship) and the ships are anchored around 4 km away from the shore. This coal is brought in to the plant by using barges (long flat-bottomed boats) and then by conveyors. The coal brought should be maintained around 10% moisture content immediately before it is used. The coal needs to be ground as powder before it is burnt. There are five “Mills” which are used to pulverize (grind) the coal. Basically, four ball mills work at a time while another one is in standby. The first stage of this Coal Power station inaugurated by the President cost $ 450 Million, while the second stage is estimated to cost $ 891 Million. The Ministry of Powrr and energy stated that the funding for this project was provided by the Chinese Government on a long term low interest rate to the Sri Lankan Government. 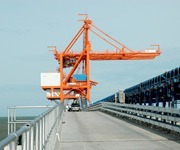 The Construction work is carried out by CMEC while the funding is provided by the EXIM Bank of the Republic of China. As local investment the Sri Lankan Government has invested Rs. 5300 Million for the first stage and Rs. 11,000 Million for the second stage of construction. A mother ship approximately 5 km at sea transports the coal to the jetty. While each ship has the capacity to bring in 65,000 Metric Tons of coal, 114 Metric tons of coal is needed per hour for a 300 MW power plant. A environmentally friendly Coal storage facility has been constructed with storage capacity for 3 months. The boiler which is 69M high and 40 M in bredth is heated to a very high temperature, while the steam produced is sent through High preasure and high temperature through turbines, thus producing electricity. In the first stage it travels from the control centre to Veyqangoda which is 117 KM releasing 220 KW to the High power transmitting channel. This Coal Power station 12 KM from the Palavi junction in the Kalpitiya pensula in the village of Narakkalli was inaugurated by the President in 2006. This Coal power station produces 300 MW in the first stage while 600 MW is produced in the 2nd stage. For 80 families that lost their property during the 1st stage of construction, houses have been constructed and presented on 20 perches complete with drinking water electricity and all basic facilities, while fishing gear has also been provided for the fisher fork. The Ministry of Power and Energy stated that with the construction of this Coal Power station the goal of 100% electricity for all will no doubt will be realised.